Create professional-looking business process modeling diagram from examples and templates with BPMN Software. 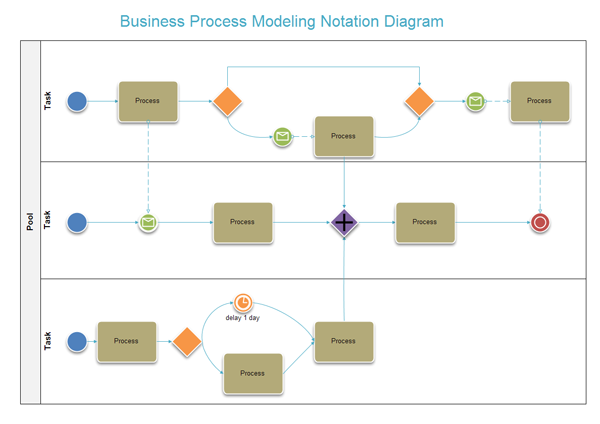 Business Process Modeling Notation (BPMN) is a graphical representation for specifying business processes in a workflow. BPMN defines a Business Process Diagram which is basically a flowcharting technique tailored for creating graphical models of business process operations. The primary goal of BPMN is to provide a notation that is readily understandable by all business users, from the business analysts that create the initial drafts of the processes, to the technical developers responsible for implementing the technology that will perform those processes, and finally, to the business people who will manage and monitor those processes. Edraw Max has the tools to make it easy to create professional-looking business process modeling notation. The professional-looking business process diagram will facilitate the understanding of the performance collaborations and business transactions between the organizations. This will ensure that businesses will understand themselves and participants in their businesses will enable organizations to adjust to new internal and B2B business circumstances quickly. It can also export to PDF, PowerPoint, Word and Graphics. Create professional-looking business process diagram from examples and templates with Edraw BPMN Software. Then you can use the built-in BPMN templates to create and present your business process in minutes. The Business Process Diagram is made up of a set of graphical elements. These elements enable the easy development of simple business process diagrams that will look familiar to most business analysts. The elements were chosen to be distinguishable from each other and to utilize shapes that are familiar to most modelers. Edraw used the standard symbol elements so that the reader of a BPMN diagram can easily recognize the basic types of elements and understand the diagram. The four basic categories of elements are Flow Objects (Event, Activity, Gateway), Swimlane, Artifacts and Connector. Learn more about create a bpmn diagram. On the start page, you can choose the BPMN Template in the Flowchart category. With the library of shapes built-in to this business process software, the BPMN tool will help you create and share professional-looking diagrams with drag-and-drop ease. 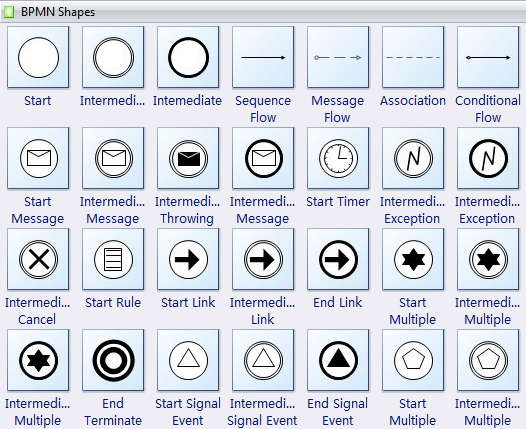 The MPMN shapes include start, intermediate, message flow, association, event, message, exception and link. All of the symbols can be changed in the background color and line color. You can modify the border style and font, too. It's easy to insert your company logo or other symbols. The following BPMN shapes are some commonly used BPMN event shapes. An Event is represented by a circle and is something that "happens" during the course of a business process. These Events affect the flow of the process and usually have a cause (trigger) or an impact (result). Events are circles with open centers to allow internal markers to differentiate different triggers or results. There are three types of Events, based on when they affect the flow: Start, Intermediate, and End (see the figures to the right, respectively). A Gateway is represented by the familiar diamond shape (see the figure to the right) and is used to control the divergence and convergence of Sequence Flow. Thus, it will determine traditional decisions, as well as the forking, merging and joining of paths. Internal Markers will indicate the type of behavior control. An Activity is represented by a rounded-corner rectangle (see the figure to the right) and is a generic term for work that company performs. An Activity can be atomic or non-atomic (compound). The types of Activities are: Task and Sub-Process. The Flow Objects are connected together in a diagram to create the basic skeletal structure of a business process. A Sequence Flow is represented by a solid line with a solid arrowhead (see the figure on the right) and is used to show the order (the sequence) that activities will be performed in a process. A Message Flow is represented by a dashed line with an open arrowhead (see the figure on the right) and is used to show the flow of messages between two entities that send and receive them. In BPMN, two separate Pools in the Diagram will represent the two entities (participants). An Association is represented by a dotted line with a line arrowhead (see the figure to the right) and is used to associate information with flow objects. Text and graphical non-flow objects can be associated with the core modeling elements. The following process modeling utilizes the concept of "swimlanes" as a mechanism to organize activities into separate visual categories to illustrate different functional capabilities or responsibilities. Business process software can help you leverage Business Process Modeling Notation (BPMN), a language that helps teams consistently depict business processes.